From appearance alone it is evident that Fox engines are different from the rest of the pack. Duke Fox was always known to be an innovator and, to some, even a little eccentric. Fox built his first model engine in 1943. Since then the sheer number and diversity of successful model aircraft engines designed and produced by this one man is truly amazing. His accomplishments included many industry firsts that advanced the state of the art. Among these were innovative new casting techniques and significant improvements in glow plug design. Even the use of nitromethane in model fuel was pioneered by Fox. While Duke Fox is no longer among us, the dedicated people at Fox Manufacturing continue the tradition of producing unique and innovative model engines.The current series of Fox engines maintain the tradition of "out-of-the-rut" appearance while providing state of the art performance. 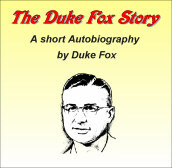 This interesting autobiography was written by Duke Fox only a few months before he passed away on Feb. 15/1991. To view or print PDF files you must have Adobe Acrobat Reader installed. You can obtain a free download from Adobe.